The term dwarf planet has been tossed around a lot in recent years. As part of a three-way categorization of bodies orbiting the Sun, the term was adopted in 2006 due to the discovery of objects beyond the orbit of Neptune that were comparable in size to Pluto. Since then, it has come to be used to describe many objects in our Solar System, upending the old classification system that claimed there were nine planets. The term has also led to its fair share of confusion and controversy, with many questioning its accuracy and applicability to bodies like Pluto. Nevertheless, the IAU currently recognizes five bodies within our Solar System as dwarf planets, six more could be recognized in the coming years, and as many as 200 or more could exist within the expanse of the Kuiper Belt. In essence, the term is meant to designate any planetary-mass object that is neither a planet nor a natural satellite that fits two basic criteria. For one, it must be in direct orbit of the Sun and not be a moon around another body. Second, it must be massive enough for it to have become spherical in shape under its own gravity. And, unlike a planet, it must have not cleared the neighborhood around its orbit. In order for a body to be become rounded, it must be sufficiently massive, to the point that its own gravity is the dominant force effecting it. Here, the internal pressure created by this mass would cause a surface to achieve plasticity, allowing high elevations to sink and hollows to fill in. This does not occur with smaller bodies that are less than a few km in diameter (such as asteroids), which are dominated by forces outside of their own gravity forces and tend to maintain irregular shapes. Meanwhile, bodies that measure a few kilometers across – where their gravity is more significant but not dominant – tend to be spheroid or “potato-shaped”. The bigger the body is, the higher its internal pressure, until the pressure is sufficient to overcome its internal compressive strength and it achieves hydrostatic equilibrium. At this point, a body is as round as it can possibly be, given its rotation and tidal effects. This is the defining limit of a dwarf planet. However, rotation can also affect the shape of a dwarf planet. If the body does not rotate, it will be a sphere. But the faster it does rotate, the more oblate or even scalene it becomes. The extreme example of this is Haumea, which is twice as long along its major axis as it is at the poles. Tidal forces also cause a body’s rotation to gradually become tidally locked, such that it always presents the same face to its companion. An extreme example of this is the Pluto-Charon system, where both bodies are tidally locked to each other. The upper and lower size and mass limits of dwarf planets have not been specified by the IAU. And while the lower limit is defined as the achievement of a hydrostatic equilibrium shape, the size or mass at which an object attains this shape depends on its composition and thermal history. For example, bodies made of rigid silicates (such as rocky asteroids) should achieve hydrostatic equilibrium at a diameter of approx. 600 km and a mass of 3.4×1020 kg. For a body made of less rigid water ice, the limit would closer to 320 km and 1019 kg. As a result, no specific standard currently exists for defining a dwarf planet based on either its size or mass, but is instead more generally defined based on its shape. In addition to hydrostatic equilibrium, many astronomers have insisted that a distinction between planets and dwarf planets be made based on the inability of the latter to “clear the neighborhood around their orbits”. In short, planets are able to remove smaller bodies near their orbits by collision, capture, or gravitational disturbance (or establish orbital resonances that prevent collisions), whereas dwarf planets do not have the requisite mass to do this. To calculate the likelihood of a planet clearing its orbit, planetary scientists Alan Stern and Harold F. Levison (the former of whom is the principal investigator of the New Horizons mission to Pluto and the Chief Scientist at Moon Express) introduced a parameter they designated as ? (lambda). This parameter expresses the likelihood of an encounter resulting in a given deflection of an object’s orbit. The value of this parameter in Stern’s model is proportional to the square of the mass and inversely proportional to the period, and can be used to estimate the capacity of a body to clear the neighborhood of its orbit. Astronomers like Steven Soter, the scientist-in-residence for NYU and a Research Associate at the American Museum of Natural History, have advocated using this parameter to differentiate between planets and dwarf planets. Soter has also proposed a parameter he refers to as the planetary discriminant – designated as µ (mu) – which is calculated by dividing the mass of the body by the total mass of the other objects that share its orbit. There are currently five dwarf planets: Pluto, Eris, Makemake, Haumea, and Ceres. Only Ceres and Pluto have been observed enough to indisputably fit into the category. The IAU decided that unnamed Trans-Neptunian Objects (TNOs) with an absolute magnitude brighter than +1 (and a mathematically delimited minimum diameter of 838 km) are to be named as dwarf planets. Possible candidates that are currently under consideration include Orcus, 2002 MS4, Salacia, Quaoar, 2007 OR10, and Sedna. All of these objects are located in the Kuiper Belt or the Scattered Disc; with the exception of Sedna, which is a detached object – a special class that applies to dynamic TNOs in the outer Solar System. It is possible that there are another 40 known objects in the solar system that could be rightly classified as dwarf planets. Estimates are that up to 200 dwarf planets may be found when the entire region known as the Kuiper belt is explored, and that the number may exceed 10,000 when objects scattered outside the Kuiper belt are considered. In the immediate aftermath of the IAU decision regarding the definition of a planet, a number of scientists expressed their disagreement with the IAU resolution. Mike Brown (the leader of the Caltech team that discovered Eris) agrees with the reduction of the number of planets to eight. However, astronomers like Alan Stern have voiced criticism over the IAUs definition. Stern has contended that much like Pluto, Earth, Mars, Jupiter, and Neptune have not fully cleared their orbital zones. Earth orbits the Sun with 10,000 near-Earth asteroids, which in Stern’s estimation contradicts the notion that it has cleared its orbit. Jupiter, meanwhile, is accompanied by a whopping 100,000 Trojan asteroids on its orbital path. Thus, in 2011, Stern still referred to Pluto as a planet and accepted other dwarf planets such as Ceres and Eris, as well as the larger moons, as additional planets. However, other astronomers have countered this opinion by saying that, far from not having cleared their orbits, the major planets completely control the orbits of the other bodies within their orbital zone. Beyond the content of the IAU’s decision, there is also the controversy surrounding the decision process itself. Essentially, the final vote involved a relatively small percentage of the IAU General Assembly – 425 out of 9000, or less than 5%. This was due in part to the timing of the vote, which happened on the final day of the ten-day event when many members had already left. However, supporters of the decision emphasize that a sampling of 400 representative out of a population of 9,000 statistically yields a result with good accuracy. Ergo, even if only 4-5% of the members voted in favor of reclassifying Pluto, the fact that the majority of said members agreed could be taken as a sampling of IAU opinion as a whole. There is also the issue of the many astronomers who were unable to attend to the conference or who chose not to make the trip to Prague. Astronomer Marla Geha has also clarified that not all members of the Union were needed to vote on the classification issue, and that only those whose work is directly related to planetary studies needed to be involved. Lastly, NASA has announced that it will use the new guidelines established by the IAU, which constitutes an endorsement or at least acceptance of the IAUs position. Nevertheless, the controversy surrounding the 2006 decision is by no means over, and we can expect further developments on this front as more “dwarf planets” are found and designated. Understanding what is a dwarf planet according to the IAU is easy enough, but making the solar system fit into a three tiered classification system will prove increasingly difficult as our understanding of the universe increases and we are able to see farther and farther into space. We have written many articles about dwarf planets for Universe Today. Here’s one about Dwarf Planets, and here’s one on Why Pluto is no longer a planet. Astronomy Cast also has an episode all about Dwarf Planets. Listen here, Episode 194: Dwarf Planets. For more information, check out NASA’s Solar System Overview: Dwarf Planets, the Solar System Exploration Guide on Dwarf Planets, and Mike Brown’s Dwarf Planet page. Perhaps more could be said contrasting moons with planets – like Titan being bigger than Mercury and having an atmosphere or Ganymede having a global magnetic field compared to Mercury or Mars. And Pluto has more moons than Mercury, Venus, Earth, and Mars. On the other hand there is something that delineates a moon vs a planet – moons can’t have long duration moons. Apparently the tidal interactions will crash or eject something orbiting a moon. But doesn’t that necessarily clear it’s orbit? Keep in mind that Mercury is twice as massive as Titan. Mass is what makes a planet dominate its region. And Jupiter has 10,000s times more mass than Mercury. Mercury and Jupiter are so similar, that’s why they are in the same IAU category. Pluto is totally different. Ehm, no this doesn’t make sense. I don’t see why a moon couldn’t have a moon of its own. We don’t see any in the Solar System, but it’s not obvious to me why. Moons of the Sun (planets) have moons of their own, so why? There is no reason, for instance, why Jupiter couldn’t capture a binary asteroid. Just another outstanding piece by Matt. Thanks so much for your articles. I agree. It is well written and describes the known issues. Unfortunately, most of the sites you recommend promote only the IAU definition. For the sake of fairness, you really need to provide readers with both sides of this issue. It is worth remembering that Alan Stern is the person who first coined the term “dwarf planet,” and that he did so with the intention of designating a third class of planets in addition to terrestrials and jovians, not with that of designating non-planets. By saying dwarf planets are not planets, the four percent of the IAU that voted in 2006 (424 out of 10,000) misused his term. In their 2000 study, which you reference, Stern and Levison differentiate between “uber planets” which gravitationally dominate their orbits, and “unter planets,” which do not. However, they clearly consider both as subtypes of planets, an important point not noted in this article. Dwarf planets experience the same processes as their larger terrestrial counterparts. The only difference between the two categories is that dwarf planets are smaller. Many have geology and weather and are geologically differentiated into core, mantle, and crust, just like their terrestrial counterparts. Two of them, Pluto and Ceres, may harbor subsurface oceans that could host life. Several hundred professional astronomers immediately signed a formal petition rejecting the IAU decision back in 2006. Many had offered their assistance in the process of coming up with a definition of planet, but their offers of help were ignored by the IAU leadership. In 2009, a group of planetary scientists asked the IAU to reopen the planet definition discussion; the leadership refused, and the group boycotted the conference. The real issue here is the difference between astronomers, who study a variety of subjects ranging from stars, galaxies, quasars, pulsars, cosmology, etc., and planetary scientists, who specifically study planets. Most of the 424 IAU members who voted in 2006 were not planetary scientist but other types of astronomers. How does it make sense for them to be the ones defining the term “planet?” Additionally, many planetary scientists are not IAU members at all. If anyone defines the term “planet,” it should be those who study planets, not those who study other, unrelated subjects. Laurel, I’ve already said in the article how this decision was contentious. As always, I must stress we do not endorse the IAU’s decision, we merely include it in our articles as a matter of fact. So please don’t tell me to alter what I write to suit your position, especially when one of the sources you offer is from your own website. You’re not seeking balance, you’re seeking representation. I’m not asking you to support my position, but I am requesting that you include an equal number of sources representing each side of the debate. Would you consider adding my blog as one of many references on this topic? You’re asking me to include links to sources that agree with your stance. What is that if not endorsement. And since they are not referring to the IAU decision, but are links to websites that discuss the planets in question, or what TNOs or KBOs are, I don’t see how any of that is even relevant. And yes, I would consider posting a link to your website if and when the issue was the IAU decision alone and counter-arguments. However, I have already mentioned who the dissenting voices were and what their arguments were. Beyond that, I don’t see what more can or should be said. You include Mike Brown’s page. How does that not equal endorsement? I don’t want endorsement, just equal time, and would be very happy with a source other than mine, such as The Great Planet Debate, which actually included both sides. I genuinely appreciate your willingness to include my blog in articles about Pluto. That was nice of Mike Brown to provide you with a graphic that incorrectly shows Eris to be larger than Pluto. However, you should know better than to use it. New Horizons has found Pluto to be larger than Eris. Please use graphics that do not contain inaccurate information. Great point. That isn’t Brown’s only error. In his book, he says planets have circular orbits even though we know from Kepler’s Laws that their orbits are elliptical. Also, he denies that Pluto is currently geologically active even in the face of direct evidence from New Horizons data. Ceres and Pluto currently dominate discussions of dwarf planets because they are the only ones we have visited and viewed up close. Hopefully, missions to the other dwarf planets will be launched in the near future. That image is public domain and we use it because it provides a rundown on the currently known dwarf planets. If you have an issue with our factual representations, perhaps you should refer to our articles themselves – which have covered the New Horizons mission and the information gleamed by the Pluto flyby. That would far more advisable than criticizing the use of an image based on perceived misrepresentations or personal bias, thank you. What the readers should know is that Pluto and Eris have roughly the same diameter, but Eris is 27% more massive. So the diagram is just fine for the casual reader to glance at. I felt the article covered the issues fairly. There are now updated graphics of TNOs that use New Horizons images to depict Pluto and Charon. Pluto will never again be considered a major planet. We either have 8 planets or we have 90+ and climbing. A quick look at Mike Brown’s website shows that. And that does not even include the 19 spherical moons in the Solar System. A better schematic is to use the planet subcategories recommended by Alan Boyle in his book “The Case for Pluto.” These categories are terrestrial planets, jovian planets, and dwarf planets. So what if we have 90+ planets? The argument that we have to artificially keep the number of planets small for the sake of convenience or memorization has no scientific merit. If our solar system has 90+ planets, then that is what it has. We can distinguish moons as secondary or satellite planets from primary planets that orbit the Sun directly, distinguishing these two subcategories of planets. I don’t really care what Mike Brown’s site says because science doesn’t work by appeal to authority or individual. Dwarf planets can and will be considered a subclass of planets as we learn more about how similar to their larger counterparts they are. There is no single “proper” definition of dwarf planet, no matter what HeadAroundU says. There are several competing definitions, all of which are scientifically sound. Folks, I think we’ve debated this long enough, yes? Speak for yourself. Science isn’t about hero worship. I never said what I thought the definition of a dwarf planet is; however, be it known I subscribe to Dr. Alan Stern’s view that dwarf planets are planets. 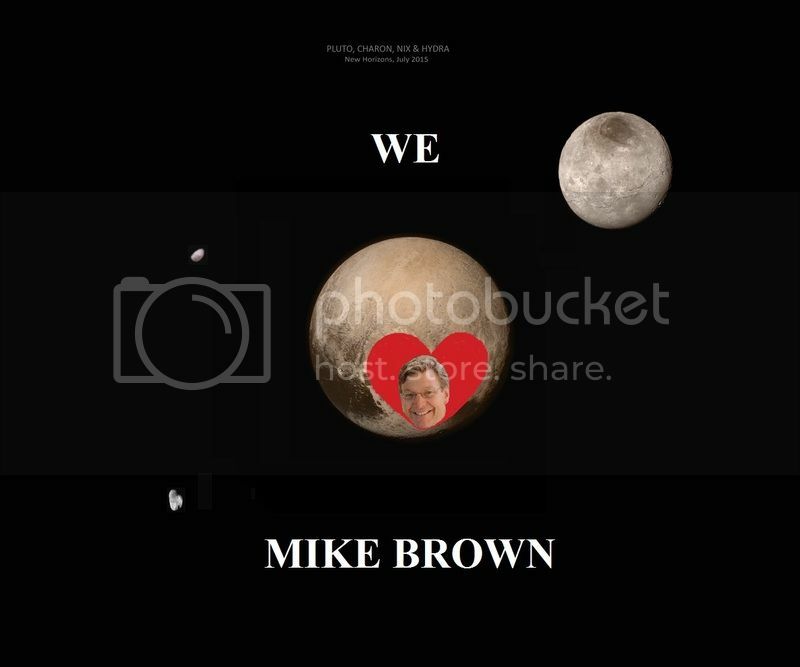 It is nice to know Mike Brown is loved for his delusional belief that he killed Pluto. We do not have 90 + and counting. Hydrostatic equilibrium has not been confirmed for Sedna, Biden, etc. 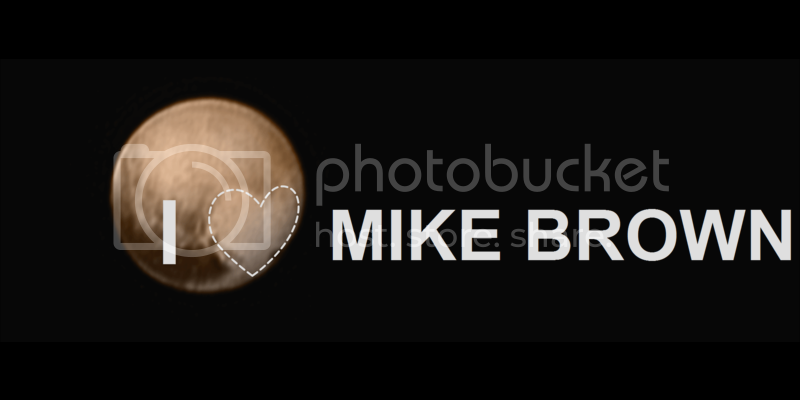 If your only source for knowledge on planetary science is Mike Brown’s website, I pity you. Anyway, I only wanted to point out to Matt that that graphic is inaccurate and shouldn’t be used anymore. Those of you who wish to have a Mike Brown lovefest are free to do so. Know, however, that that he is not the sole authority on planetary science; and, if you do not get up to speed on other planetary scientist’s beliefs, you’re are forming an out-of-date and factually inaccurate view of the Universe. Dr. Alan Stern is learning a lot of new things by studying the data New Horizons is sending back to Earth. Ya’ll would be well-advised to get with the program. Kevin, unless you are the great great great great great grandson of Nostradamus, you should avoid saying never. Never say never, mon. Pluto may become a planet once again, and you might end up having to eat your hat. After all, only a fraction of the data is back from New Horizons, and Pluto is looking more and more like a planet every nanosecond. 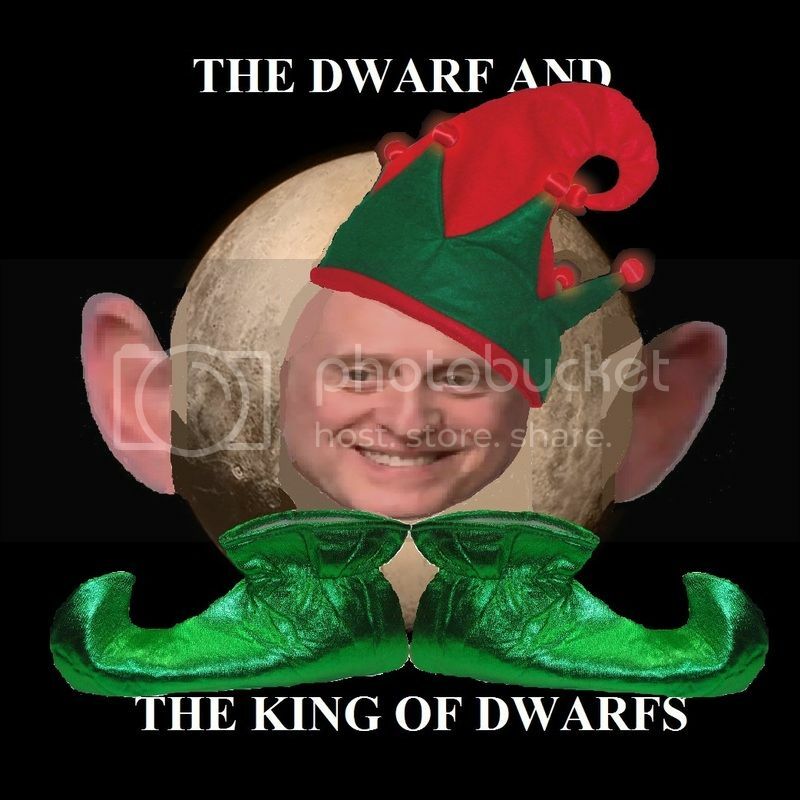 And, with a champion like Dr. Alan Stern who Neil deGrasse Tyson would not accept Stern’s challenge to debate the issue of status, it looks like dwarf planets are going to soon get the respect they deserve.